A response to Ron Suarez’ A New Ann Arbor City Council Resolution to End the War in Iraq? Note: the antiwar resolution mentioned on Ron’s site was passed by the Ann Arbor City Council in March, 2007. …But, I could use help identifying other government officials who could use a nudge in the correct direction. 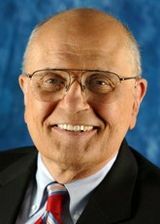 John Dingell. He often wears red. His recent antiwar resolution, HR 3938 sounds good at first in that it reportedly withdraws the use of force authorization. The full text was not yet on Thomas when I wrote this. But the 2009 timeframe is too long. And this is a political cover for Dingell in that it distracts from what matters, which is his votes for the appropriations for the wars. Dingell’s resolution won’t pass both houses, and if it did it would be vetoed. He knows that. If a majority of the House would refuse any more defense authorizations the war would end. Soon. Maybe some mainline Democrats want the war to continue. It is good for the business of the people who give them money. One hopes Dingell would not be in this category. We need to focus in the short term on amending or defeating war appropriations. Resolutions like the proposed council resolution and HR 3938 give political cover to mainline Democrats who feel pressure from an increasingly frustrated public. But they don’t end the war. They give it political cover to continue. What does Peaceworks mean that Congress should “move in a bi-partisan way?” Isn’t that kind of like a three-legged sack race? Seriously are the Democrats supposed to wait to defund the war until the Republicans turn into a pro-peace, anti-war party? This is a poor idea at best. The Peaceworks resolution’s reference to “joint authority” between the president and Congress over “war spending and war powers” is inaccurate. The Constitution reserves these powers to Congress alone. The Congress shall have Power To lay and collect Taxes, Duties, Imposts and Excises, to pay the Debts and provide for the common Defence and general Welfare of the United States; …. The president is an executive of the People, who acting through their Legislature, make the laws and raise taxes. We rely on the President to obey and fairly enforce the laws, not to ignore, make, or break them. The president is not a sovereign. Bush is not “King (or warlord) of America”. HR 2638: Making appropriations for the Department of Homeland Security for the fiscal year ending September 30, 2008, and for other purposes, in committee. HR 2642: Making appropriations for military construction, the Department of Veterans Affairs, and related agencies for the fiscal year ending September 30, 2008, and for other purposes, in committee. HR 3222: Making appropriations for the Department of Defense for the fiscal year ending September 30, 2008, and for other purposes, resolving differences. And we need to oppose any more continuing resolutions like Democratic sponsored H.J.RES.52: Making continuing appropriations for the fiscal year 2008, and for other purposes, which Bush signed September 29, 2007. Bush and the House and Senate Democrats like Dingell and Stabenow are pretending to disagree over the war to appeal to their base constituencies, while they are collaborating in continuing to fund it. I don’t have the same issue with Carl Levin, he and John Rockefeller have been fighting very hard behind closed doors on the war, concentration camps, and surveillance issues for a long time now. What’s the cost to the citizen? Tens or hundreds of thousands of Iraqi dead; Thousands of American casualties; Military suicides and fragging incidents on the rise; America’s democracy and reputation in ruins; and $8,000 per person in the US through the next ten years. Or, if you want to look at it another way, $80,000 per person in Iraq. We could have bought all of Iraq intact for less than what it is costing to destroy it. Feel-good resolutions without the force of law are a distraction and an impediment to holding our legislators accountable for real effective actions to end this garrison state of permanent war and neoconservative-neofascist oppression. A New Ann Arbor City Council Resolution to End the War in Iraq?